On the weekend following my mum’s surprise sixtieth birthday we went to Centre Parcs. The choice of destination was largely determined by not knowing where to go with a baby. We didn’t fancy being in a hotel room with ThingOne, having to be quite so as not to wake her up and not being able to stray far when she’s asleep at night. 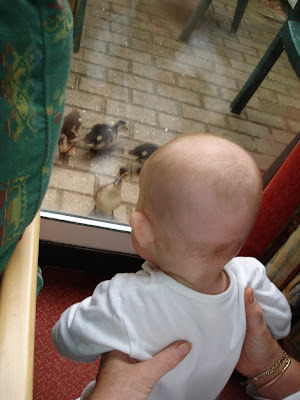 Some friends recommended Centre Parcs, and we’d never been so thought we’d give it a try. It worked out well. With my mum, sister and brother-in-law there we had five adults to entertain ThingOne, which kept her fairly happy, and there was a fair amount for us to do. Anne even got a morning at the spa, which I think is the most time she’s had off in six months. We took ThingOne for a swim each day, which she loves. Anne takes her to the local pool each week for a baby session, so it was nice to be able to do it myself. ThingOne didn’t really make the most of the facilities. Her bike riding is rubbish, and her abseiling woeful, but I think she enjoyed herself. 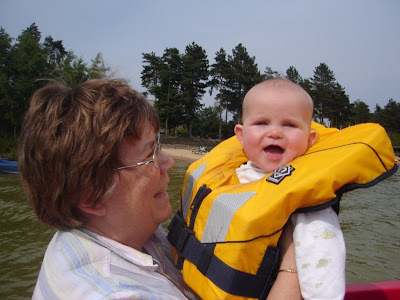 My mum and I took ThingOne out in a pedalo while Anne watched a football match (an England World Cup game). We thought ThingOne might find it cool being on the water, but she was more interested in watching our feet as we peddled. She looked a bit ridiculous in her life jacket, so at least we had a laugh at her expense.